The beginning of monastic life at Meteora on the rock of Agios Stephanos, where the Monastery of Saint Stephen is located today, dates back to early in the 12th century. Saint Anthony Kantakouzenos, in the first half of the 15th century, is the first founder of the monastery, and Saint Philotheos (June 13), who renovated or rather rebuilt from its foundations the old small and elegant Katholicon, the present Church of Saint Stephen, in 1545 is referred to as its second founder. Anthony was probably known as Manuel in the world, and was probably the son of Nikephoros II Orsini and Maria Kantakouzene, but we do not know this for sure. Nikephoros was the ruler of Epirus from 1335 to 1338 and from 1356 until his death in 1359. 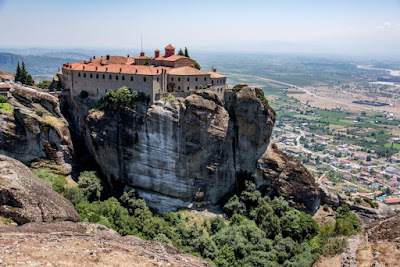 This would make him the grandson of the first founder of the Transfiguration Monastery in Meteora and the second cousin of the second founder, both of whose name were Joasaph. He probably took the name Anthony when he was tonsured a monk, and he went on to establish the Monastery of Saint Stephen at Meteora. We do not know much more about his life. After living a God-pleasing life, he reposed there in peace.